My trainer keeps complaining that I sit in a forked seat. 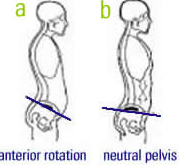 ​Women tend to have more of an arch (inward curve toward the belly) in the lumbar area of the back than men, and some women dramatically so due to the way they stand and sit. I used to have this problem. "Sitting deep" in the saddle was a real problem for me because I essentially sat on my crotch, so sitting trot was very painful. 1. Invest in a comfort twist saddle--the ones that are designed for a female pelvis. Back in the day, the only dressage saddles available were designed for men, whose pelvises are very deep and narrow. The female pelvis is wide and shallow. Saddles were introduced in the 1980's with something called a "comfort twist": The seat was a little deeper and wider, making it far more comfortable for women. 2. Gently flatten your back and strengthen your abs. Pilates exercises are good for this. Lie on your back on the floor with your knees bent slightly, and put a hand under your lumbar (lower) back. There should be space between your back and the floor, but not a lot. Gently press your lower back to the floor while tightening your abs and rolling your pelvis under you (as though you are pulling your hip bones up toward your rib cage. Another good one is to stand, roll your pelvis under slightly, and place your ankle above the knee of the opposite leg. Then stretch up tall a bit. You will feel your lower back stretch and flatten. 3. Check your sitting position to ensure that you are sitting on your seat bones, not your crotch. If you don't know where your seat bones are, do this: Sit on a hard flat surface, like a coffee table. Flatten your lower back by rolling your pelvis under you, and then arch your back by sticking your bottom out behind you. As you do this, you will alternately find yourself sitting on your back pockets (as you flatten your back), then on your seat bones (as you relax your back), then on your crotch (as you arch your back). Do this a few times until you are very certain when you are sitting on your seat bones. That is a balance, flexible seat, and it is how you should be sitting in the saddle. Here is a picture showing a hollow/arched back and a neutral back from phfitness.com. 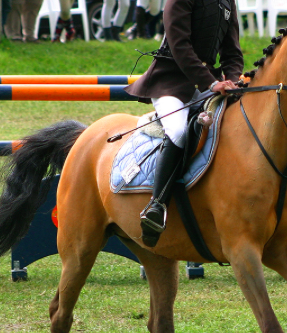 For more in-depth info, see Why It Hurts to Sit in Your Dressage Saddle.